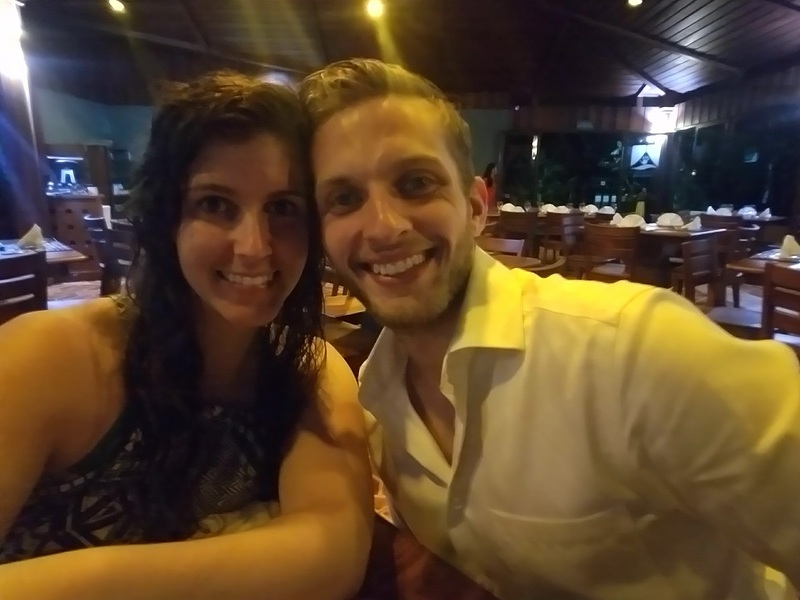 Click here to read Honeymoon Recap – Part 2. 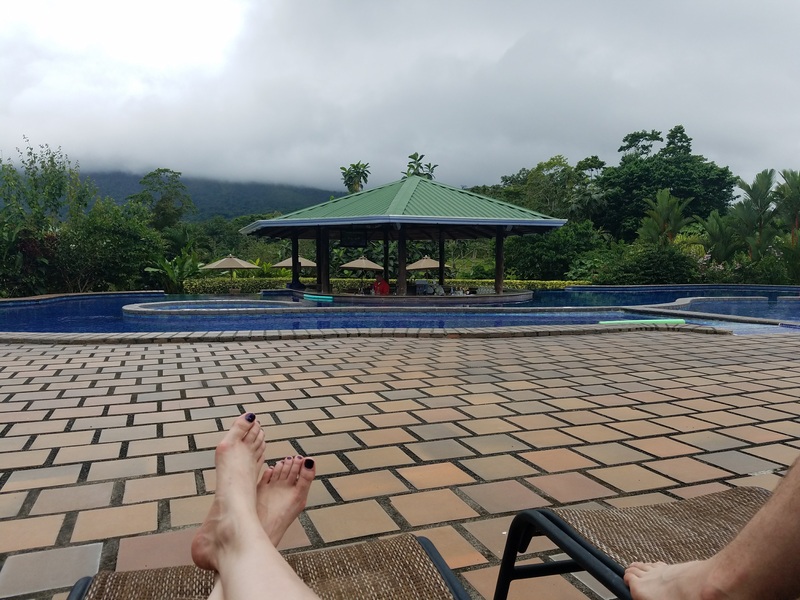 I loved our stay at Encantada, but I was really looking forward to Arenal. It was the one “must see” location that we had on our list. 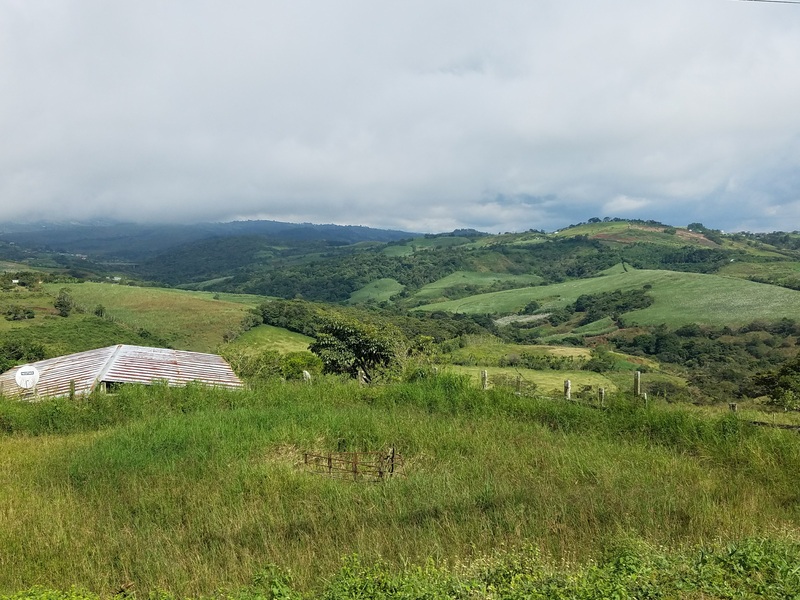 The drive from Esterillos to La Fortuna was estimated at 3 hours. Because of the single-lane roads, elevation changes, and winding roads through the mountains, it ended up taking almost 5 hours! The roads were really poor; full of pot holes. And, the drivers don’t obey traffic laws. Many times, a truck would pass us on a turn on a two-lane road. It was very dangerous, but it was widely accepted in Costa Rica. The vehicle being passed and the car in the oncoming lane would slow down and yield to the passing vehicle. Along the edge of the road people would walk with their children, pets, and livestock. Cars would pass by at 40-50 mph, and nobody was phased. 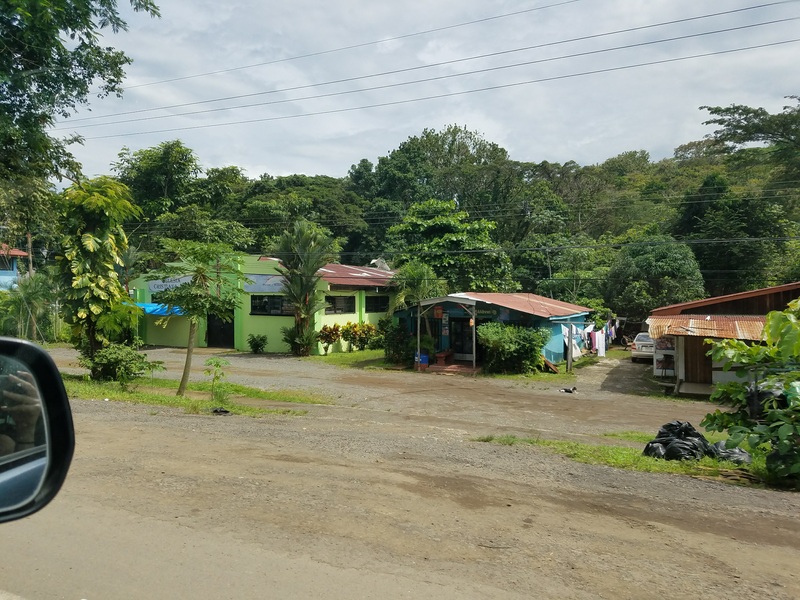 When we arrived at our resort, Hotel Arenal Manoa, it was interesting to see other tourists. We realized we were so secluded in Esterillos. The resort was beautiful, full of luscious flowers and greenery everywhere. The resort was made up of freestanding suites — all with a panoramic view of the volcano. 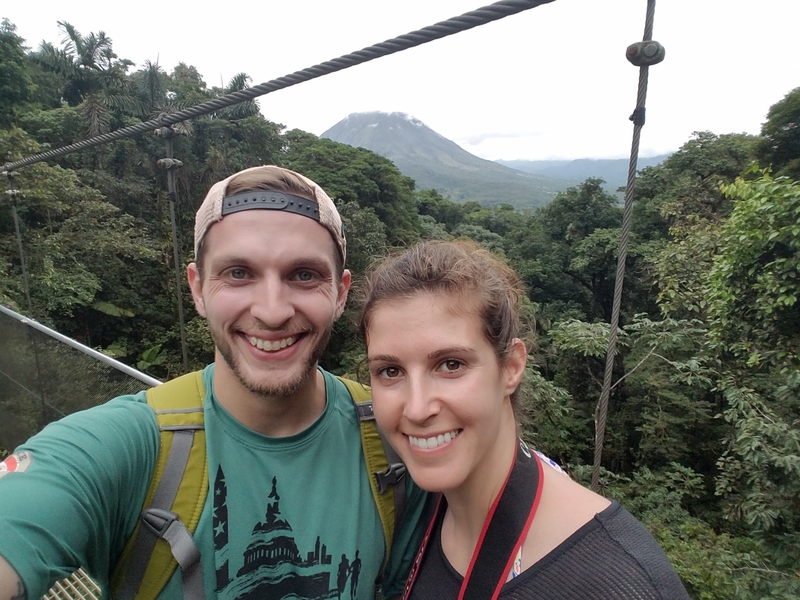 On Friday, after breakfast at the hotel, we headed to Mistico Arenal Hanging Bridges Park. The 2 mile hike included 16 bridges — 6 hanging bridges and 10 fixed bridges. I was really excited to go hiking in the rain forest. 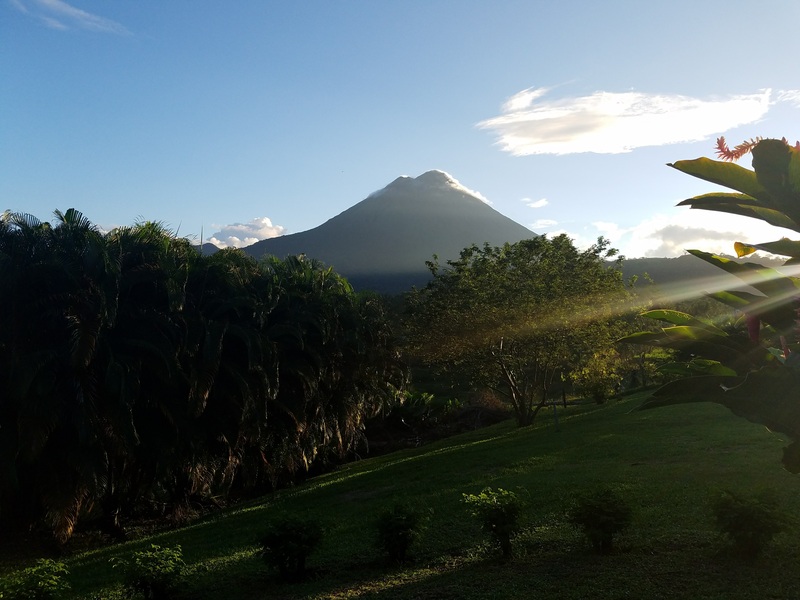 We had yet to see any macaws, toucans, or monkeys, and Arenal was suppose to be one of the best places to view wildlife! We decided to save some money and do a self-guided tour. Right as we entered the trail, 3 peccary crossed in front of us! They quickly ran away, but we were excited to see wildlife right off the bat. Shortly after, we passed through a butterfly and hummingbird garden. It was beautiful and full of hummingbirds! Unfortunately, aside from a few spiders, we didn’t see any more wildlife. I wondered if a guided tour would have been better, or if the large group behind us was too noisy and scared off the animals. Probably both! Overall, the hike itself was really nice. 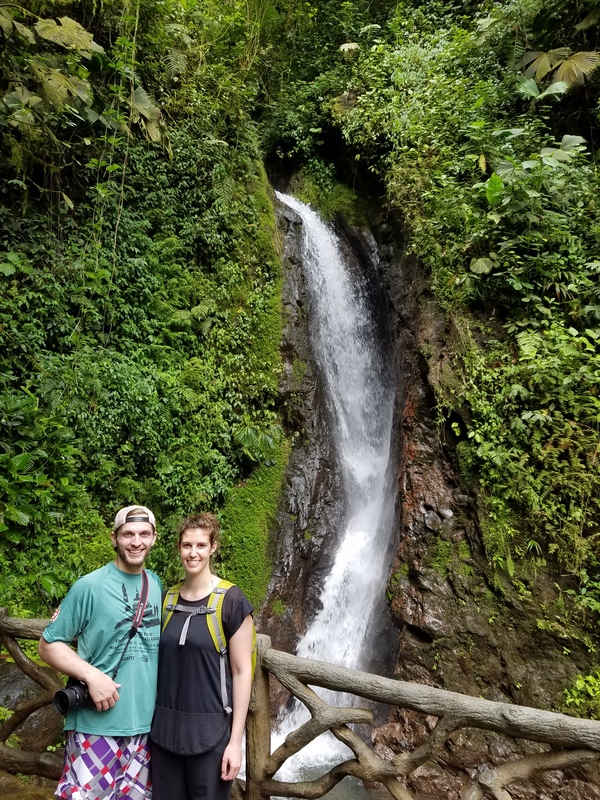 We were able to see the rain forest at all levels, and even see a huge waterfall. We spent the rest of the afternoon reading our books by the pool and hanging out with the bartender. It rained most of the afternoon, so we stayed under the gazebo. 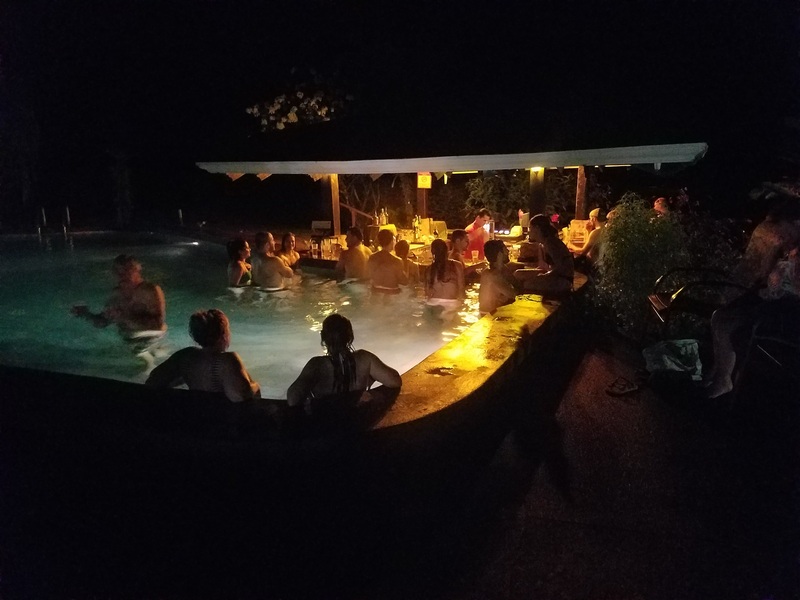 After sunset, but before dinner, we walked to the other pool on the property for happy hour. The other pool happened to be a natural hot spring. The water was really warm – like a Jacuzzi! We hung out there for about an hour then headed back to the room to get ready for dinner. We left Saturday morning to head back to Esterillos. The drive back wasn’t as long as the ride there — only 3.5 hrs versus 5. Thank God!